When Mike Berdowski enrolled in his history 300 course, he knew he would be learning the methods of conducting historical research. But the senior history major from LaPorte knew nothing of the topic when Anne Foster, associate professor of history, handed out information on Indiana State University's sit-in and race riot that occurred in the late 1960s and early 70s. That unrest led to the establishment of Indiana State's African and African-American Studies program and the university's African-American Cultural Center. "One thing I learned was there was a riot, there was unrest at ISU," he said. In teaching the methodology class, Foster likes to link it to local history. In the 40th anniversary of the studies program, she found the local connection. 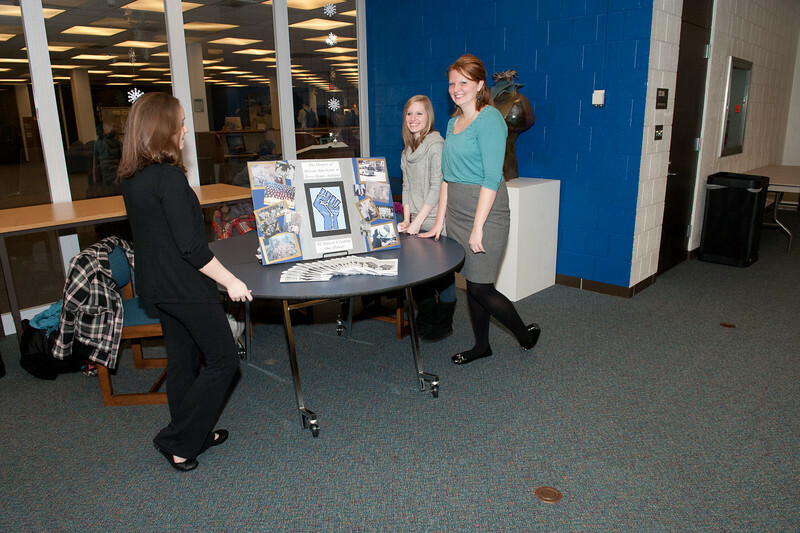 On Dec. 10, the students' groups presented their findings to the university and the community. "I think they've learned that history is hard and a little unpredictable," Foster said. The sit-in, race riot and other efforts led to the establishment of an African-American Studies program, which the Indiana Commission on Higher Education approved in August 1972. Indiana State's interdisciplinary program is one of the first in the Midwest and one of the earliest in the nation. 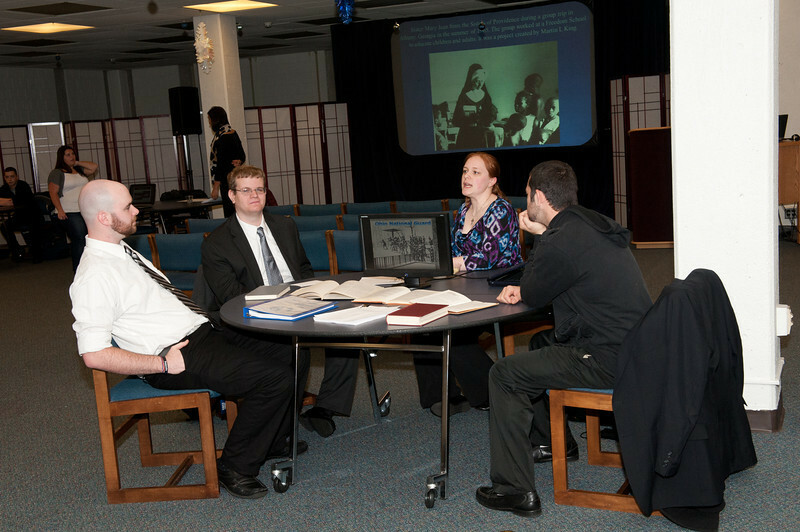 Students' projects included research into the May 1970 race riot, newspaper coverage of that event, general explorations of black and white student relations, experiences of African-American athletes at Indiana State as well as race relations and civil rights in Terre Haute. Chelsea Young, a senior social studies education major from Terre Haute, agreed with Foster that researching history can be difficult. She and her group investigated race relations in Terre Haute and found "Terre Haute didn't really have a Civil Rights movement," but that residents did travel south to help with efforts there. "It was difficult because there's not a lot of information about this. As a class, it was hard because we were hitting a lot of dead ends," she said. They interviewed 10 Terre Haute residents, read through newspaper accounts and more in their research work. "We got to get in the field and do what a historian does," said Abby Colwell, a senior history major from Terre Haute. "We learned about going into archive facilities and doing research and what to look for. Doing this for about three months makes it really sink in." Such research has real-world applications, according to Foster. "The practical side of this is they are investigating a problem for which there is no known answer," Foster said. "Almost everyone had to change their idea of what the story was because of their research." Berdowski and his group studied the administration's reaction to the student protests from the sit-in that occurred in May 1969 to the riot on April 23, 1970. "It's rather impressive that in three years (President) Alan Rankin and the rest of the administrators were able to take ISU from a campus with two black faculty and no black programs to almost 20 black faculty and the African-American Studies Program," said Ashlee James, a sophomore history major from Friendswood, Texas. "Rankin did a pretty good job." The group agreed that the riot forced administrators to take more immediate action, but that the work had long been in progress. "Having a flexible president goes a long way," James said. "Rankin was meeting with (William) Powell (one of the black student leaders) for a number of months." Dylan Houlette, a senior history major from Long Beach, Calif., studied the 1970 riot and found that Terre Haute and the surrounding area's residents helped to foster tension between the races. "African Americans would leave the campus to enjoy the town and the town was not very kind to them," Houlette said, citing a stabbing and various fights before the riot. "There were 600-800 whites at the riot and the African Americans were a much smaller group. There were not just white students at the riot, there were townsfolks." One of Houlette's group members interviewed Sam Dixon, who was a black student leader during the riot. "When I read the interview, I thought ‘That's a really tall mountain to climb and they put themselves at risk to make this university more inclusive'," Houlette said. "It's much more difficult for us to wrap our heads around because we take it for granted. Sam helped shape how different the situation is." The imprint left by leaders of the black student movement remains on the university today and it is one that pleases Berdowski. "They planted a tree that we're all taking refuge under right now," Berdowski said. "It makes me more proud of what the university has come through. It's a cool thing to know about my school." Some history students learned about ISU and Terre Haute during the racially charged 1960s and '70s, then reported on their research.